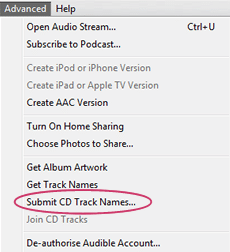 How do I submit my CD track names to automatically appear in iTunes? iTunes uses an online music database called Gracenote which is also known as CDDB® and is owned by Sony in America. 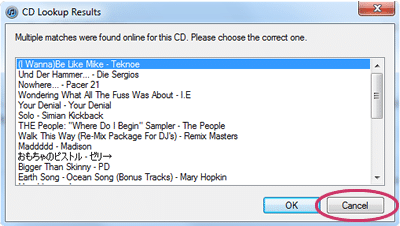 The Gracenote database looks at the number of tracks on a disc and the lengths of each of those tracks to narrow the possible disc options down as much as possible. 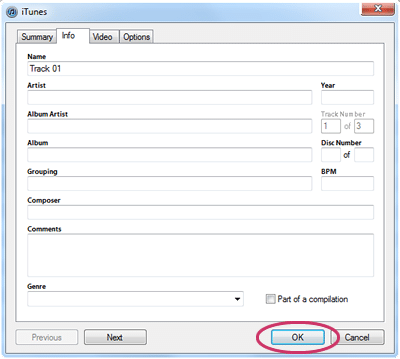 As some artists may have created CDs that have not only the same number of tracks on, but also exactly the same playing time for each track, you are sometimes presented with a list of possible albums that the CD may be when you play it in iTunes. You can submit your own CD single or album details to the Gracenote database through one of three programs; iTunes, Winamp or QMP. The details that you can submit are: artist name, album name, track name, genre, year of release and in Winamp and QMP you can also submit the record label name. First, open up iTunes and insert your finished and mastered disc (as you don’t want the track lengths changing at all after further editing otherwise the database won’t work in finding your disc). 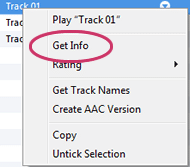 It may then take a couple of days to be registered with Gracenote, but if you then try inserting the disc and playing it in iTunes then it should present your album name in the suggested list, along with any others that have been submitted.